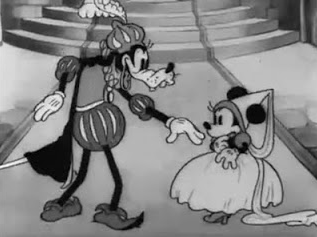 Hollywood cartoon characters up to 1934 lacked a certain luster. In the early 1930s, live-action actors were happily pigeon-holed into roles: Douglas Fairbanks was the hero, Charley Chaplin was the tramp. But these stars were exceptional. They weren’t just filling in an archetypal role – they brought something personal to the part that breathed life, emotion and depth into a character. Walt wanted to emulate Chaplin but with the fantasy of animation. “You can’t put Chaplin in a milk bottle,” Walt had said. Chaplin’s “Little Tramp” character is just one example of how character can be imbued into a comic performance to make it so rich it becomes a phenomenon. If you look at Hollywood cartoons before 1934, they may have the charm of a comic strip and the innate appeal of an archetype, but the character ends where the film stops rolling. There’s nothing going on underneath the pencil-lines that adds longevity – or soul – to that character. Babbitt was among the “intellectuals” of the young Disney Studio animators, and introduced the influence of Dostoevsky to his colleagues. In the author’s classic Crime and Punishment, for instance, he explores the underlying psyche of his characters as their behavior shifts. Classic schools of acting often discuss creating character analyses for whichever role was assigned, all to illicit a more convincing performance. Babbitt had a fascination with the psyche; later in life he would admit a long-held interest in psychiatry. In July, 1934 (at the age of 26) he sat at his typewriter and composed a three-page character analysis of a character he had actually animated before. “Dippy Dawg” was a gangly, canine-like hick that was little more than an embodiment of a silly voice provided by actor/clown/storyman Pinto Colvig. 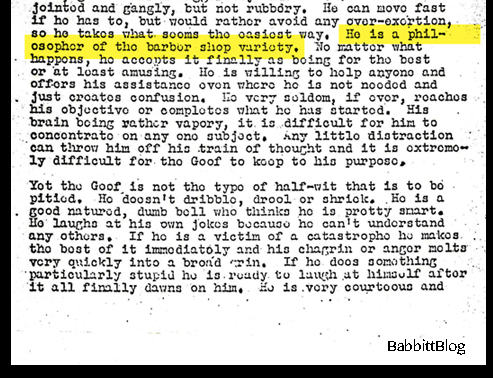 The character’s sound identified him as a goof, and that’s all he was to anyone … except to Babbitt. “Mickey’s Service Station,” 1935. The Goof earns a personality. Almost instantly the technique caught on. Babbitt’s innovation had changed the way cartoon stars were conceived, pushing them past the vacuous anything-for-a-gag realm and into characters who seemed to exist in their own right. What’s interesting is to see a glimpse of Babbitt’s personal experience that played a part in this historic innovation. He must have been incredibly receptive to the world around him, because he even invoked his barber into his description of the Goof. A “philosopher of the barber shop variety” certainly brings a certain mentality to mind, but Babbitt was actually specifically recalling his old New York City barber, whom he revisited in 1942. It even sounds like something Goofy would say. 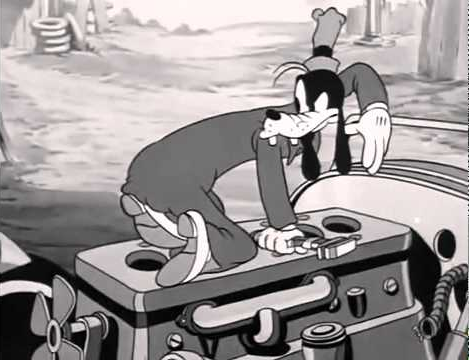 Thus Goofy’s philosophical template, and an entire method for propelling cartoon stardom, was born. 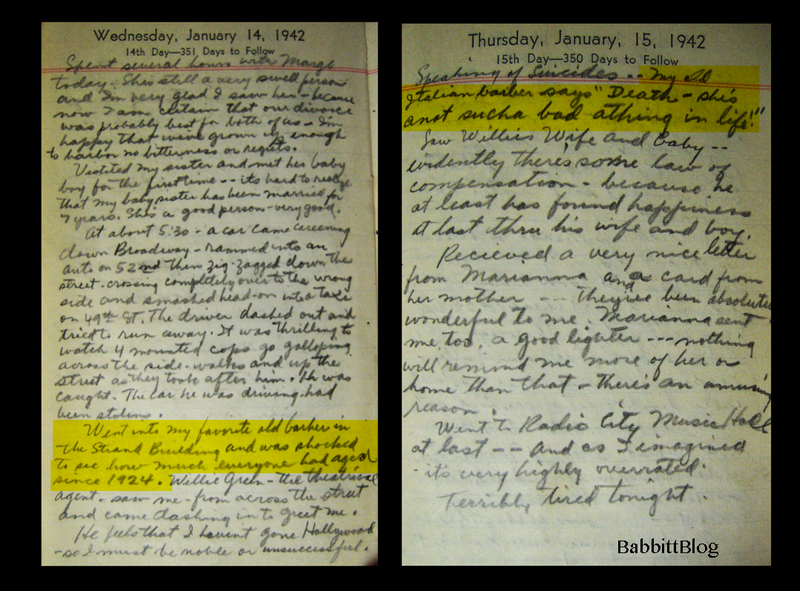 This entry was posted in 1932-1941: Disney Glory Days, Animation, New York and tagged Character Analysis, diary, Goofy. Bookmark the permalink.